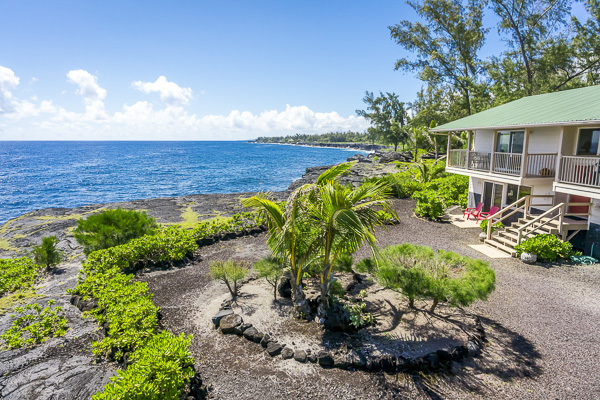 The Hawaiian name for turtle is Honu. 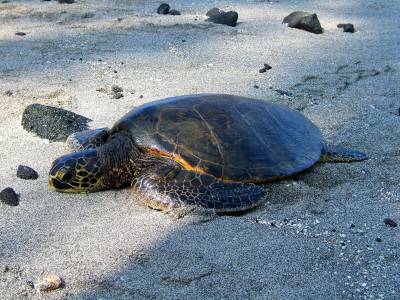 Now protected by law, Honu have become a frequent visitor to Hawaiian beaches. While it is illegal to harrass the turtles, some Honu have become so friendly that they approach tourists and beachgoers to catch a friendly glimpse. The turtle shown is a Green Sea Turtle, most of which nest in the Northern Hawaiian Islands and are the most commonly seen Hawaiian sea turtle. 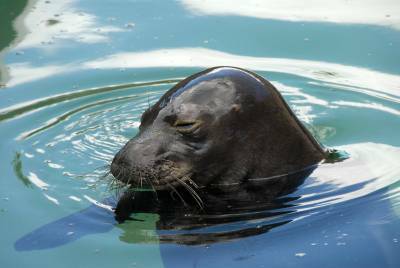 The Hawaiian Monk Seal, Monachus schauinsandii, is one of the rarest seal species in existence. While populations have somewhat stabilized, fewer than 1,400 animals remain, most confined to the Northern Hawaiian islands. Nevertheless, an occasional sighting occurs on the main islands periodically or, for the rest of us, they can be found on display at the Waikiki Aquarium. The Humpback Whale is an annual visitor to the Hawaiian waters. 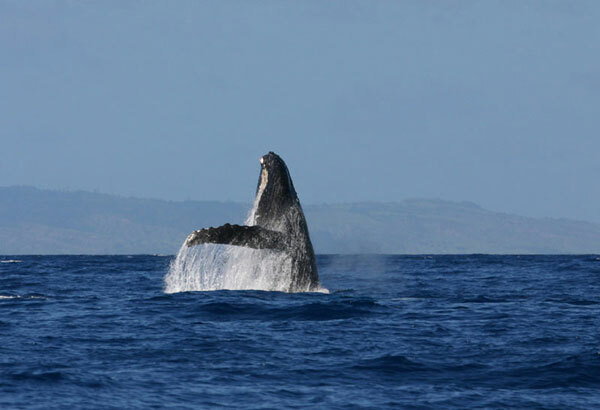 After feasting in cold Northern waters, the Humpbacks return to the warm Hawaiian waters to breed and calve. The Humpbacks typically appear in late November and reside in the islands through March or April when they begin their lengthy migration North. Calves are born in January and early February and rapidly gain size and weight prior to the migration. Spinner Dolphins can be found frequenting calm bays where they spend the night, typically foraging along the coast during the day. They will often ride before the bow of boats and are so named for the spinning acrobatic jumps they perform. The reason for the jumps is unknown and theories range from some sort of communication to sheer playfulness. 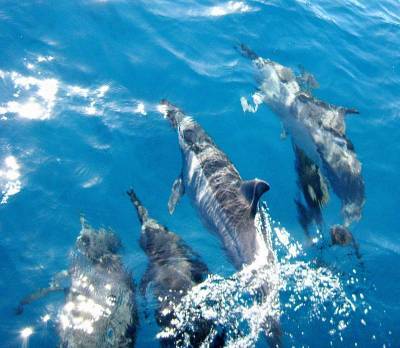 These dolphins were spotted off of La Perrouse Bay and accompanied our boat all the way across the bay. The Black Grouper, Cephalopholis argus, is otherwise known as the Blue-spotted Argus. This fish occurs widely throughout the Indo-Pacific and was found in Hawaii in the 1800s. 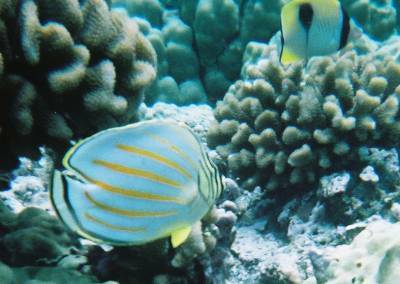 Specimens seen today, however, are likely offspring from individuals reintroduced from Moorea, Tahiti in 1956. 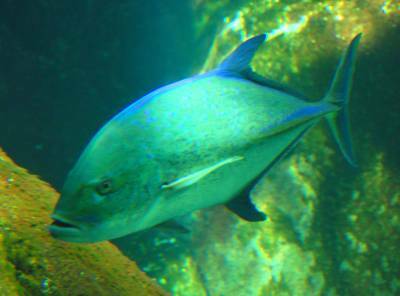 The Omilu or Hoshi Ulua, Caranxy melampygus, is also known as the Blue Crevally. This is one of several species of Jacks commonly caught in the islands. 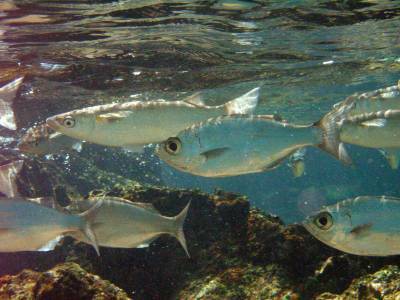 The Ulua or Papio, in juvenile form, are swift predators. Among fisherman, Ulua are reknowned for putting up a serious fight and for their firm, tasty flesh. 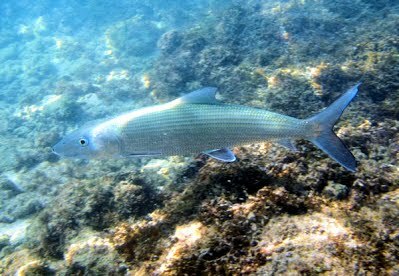 The Threadfin Jack (Kagami Ulua or Alectis indica) is a cousin of the Omilu shown above. However, when small, the Threadfin Jack has stunningly graceful, streaming dorsal, pectoral and ventral fins and is one of the most beautiful of the larger Hawaiian carnivores. Unfortunately, as it matures, the fins assume more typical proportions. I remember seeing on of these fish as a young child peering off of a pier into the deep blue water as this glimmering silver fish came to the surface where the sun reflected off its glimmering body for a few seconds before it dove down into the depths once more. 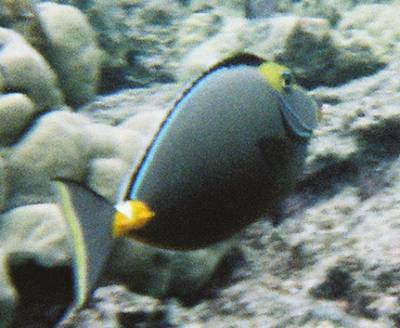 There are two species of Lau wiliwili nukunuku 'oi 'oi or Long Nosed Butterfly fish. The more common, Forcipiger flavissimus, is found throughout the islands. The rarer variety, Forcipiger longirostris, is endemic to the Hawaiian Islands and is found off of Kona where it also occurs as a black variant. 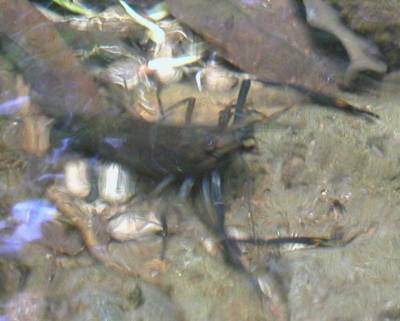 It uses its long forcep-like snout to pick out small crustaceans from narrow crevasses. 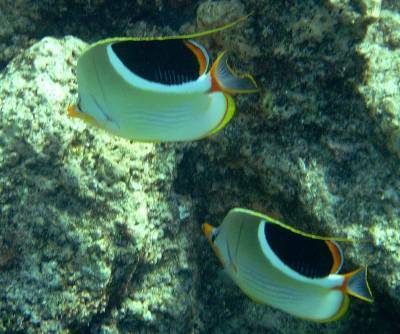 On the Kona Coast, the endemic variety of Lau wiliwili nukunuku 'oi 'oi, Forcipiger longirostris or Long Nosed Butterfly fish, has a naturally occurring black variant. Typically, they are seen in pairs, one black and one yellow. Ironically, when removed from their natural environment, these black individuals return to their yellow coloration. 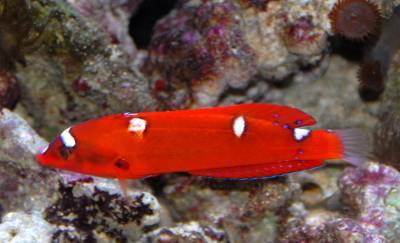 Rainbow wrasse or cleaner wrasse; Labroides phthiriphagus. These little guys set up cleaning stations on the reef, typically in pairs, and carefully remove parasites off of larger fish, often out of their very mouths. Shown here with Aholehole. 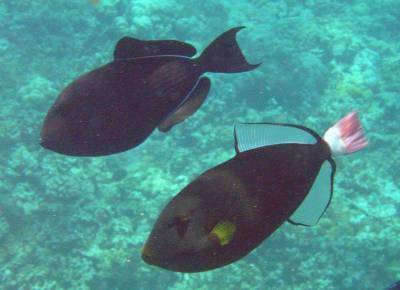 Shown are two Humu humu or trigger fish, a Black Triggerfish (Melichthys niger) and a Pink Tailed Triggerfish (Melichthys vidua). These two were part of a huge school of Black Triggerfish that I was diving within encountered off the West Coast of Maui (Rainbow Reef). Triggerfish can be aggressive to other fish and occasionally to divers, particularly if being fed. The Painted Triggerfish, Balistapus aculeatus, or Humu humu nuku nuku apua'a is typically found in deeper water reefs. Humu humu is Hawaiian meaning to fit pieces together possibly referring to its nest building habits. 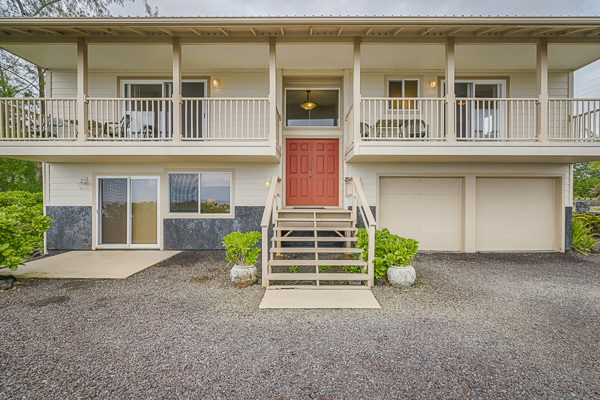 Nuku nuku apua'a means nose like a pig referring to it's blunt nose. Triggerfish have sharp beaks and are capable of cracking open crustaceans such as urchins and crabs, given half a chance. It's cousin, the triangular triggerfish was the Hawaii state fish for a number of years but was recently "voted out" and, ironically, never replaced. The Triangular Triggerfish, Balistapus rectangulus, also known as Humu humu nuku nuku apua'a in Hawaiian. 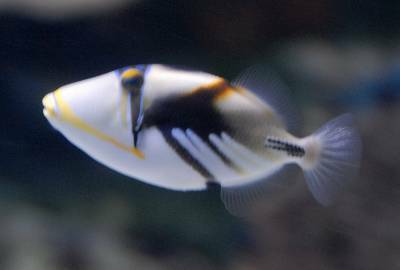 This humu humu can be found frequently on shallow Hawaiian reefs and is the triggerfish most commonly pictured as the (former) state fish. This one was photographed off of popular Waikiki Beach. A true beauty, I have seen no other butterfly that quite compares to the Ornate or Clown Butterfly fish, as reflected in its latin name, Chaetodon ornatissimus. In Hawaiian, it is called kikakapu. 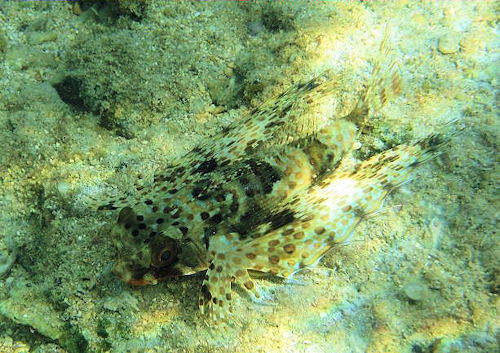 This fish prefers deeper reefs and reef ledges where it hunts for small crustaceans. Pebbled Buttlerfly or Chaetodon multicinctus is known as Lau hau in Hawaiian. The Pebbled Butterfly lives at moderate depth (20-30ft) typically near the base of large coral heads. 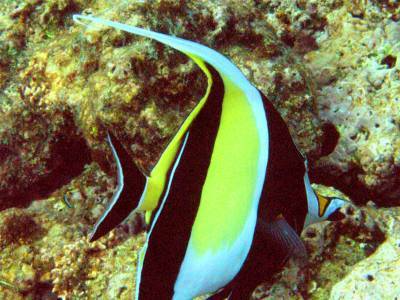 The Moorish Idol, in Hawaiian -- Kihikihi, is a real beauty to behold. It is also a real survivor, living in a variety of environments from seemingly dead polluted reefs to live and vibrant coral communities. 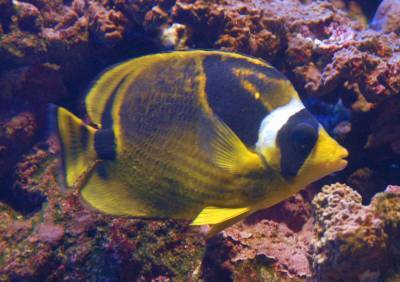 The Moorish Idol uses its long nose to peek into crevaces while searching for small crustaceons and other invertegrates. 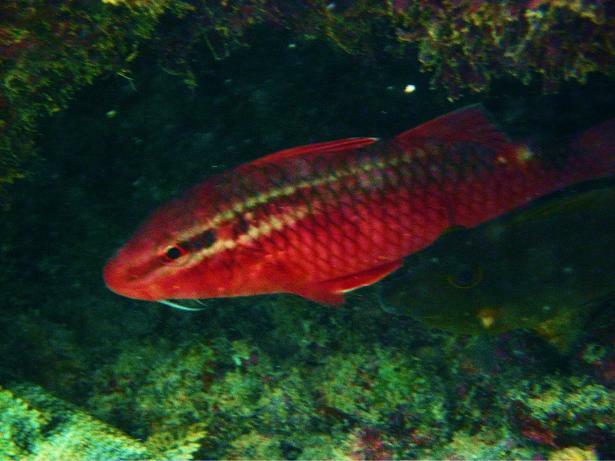 This fish is found from fairly shallow water (2-3 ft) to deeper reefs (20-30ft). The Wahoo is known in Hawaii as "Ono" (sweet) for it's firm, sweet, white meat. The Ono is a long, slender fish from the mackerel family and is known for putting up a strong fight when hooked. In Latin, it is known as Acanthocibium solandri. Malaysian prawn; these little babies are, I suspect, offspring let loose from original imported stock. In Hawaiian, shrimp or prawns are called Opae. The Malaysian prawns get quite large and are fairly flavorful. O'opu nakea, Awaous guamensis. When my father was a young man on the island of Kauai, there were many O'opu in the taro patch. 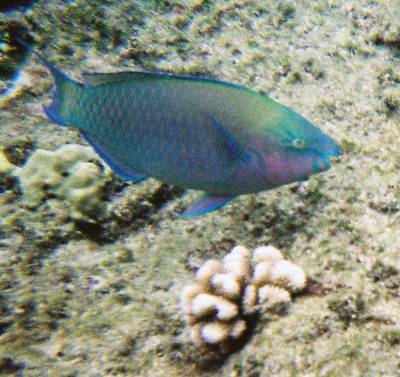 Now, on Oahu and the other more populous islands, the O'opu is rather rare, having been crowded out by non-native fish. However, in the streams of the big island there appear to still be reasonably healthy populations. 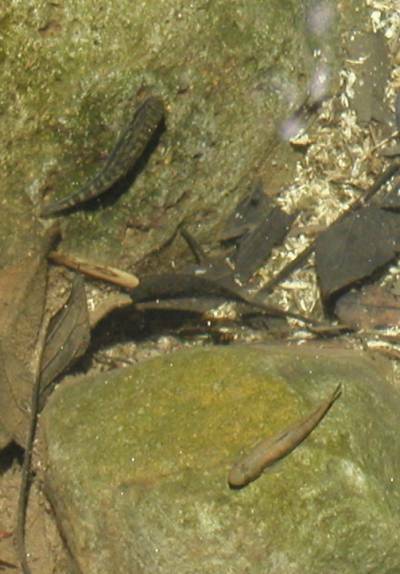 These freshwater gobies are indigenous to the Hawaiian Islands. Stenogobius hawaiiensis, O'opu naniha, the Hawaiian Striped-Cheek Stream Goby. This is arguably the most attractive of the Hawaiian stream gobies. The young are carried by the current back to the ocean and then migrate back to freshwater streams when they mature where they will breed and start a new generation. Entomacrodus marmoratus or Marbled Blenny shown here up on the rocks in the splash zone where they graze on algae and keep a keen eye out for threats (humans included). When threatened, they skip back into the water, hence the other common name, Skip Jack. These are also called o'opu. As a kid, I used to catch these for Dad to use as live bait for Ulua (Jack). 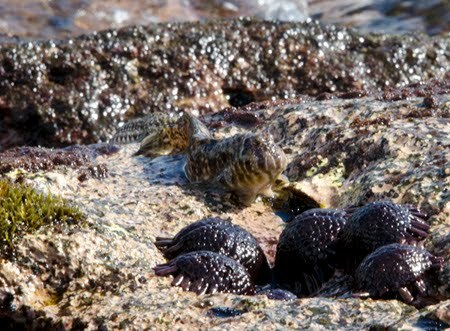 Also shown are a group of Shingle or Helmet urchins, Colobocentrotus atratus. These are called Ha 'uke 'uke in Hawaiian and, while edible, are not commercially harvested. They are usually found out of water in the splash zone clinging to large rocks. Aulostomus chinensis is known as the trumpet fish (for it's trumpet-like snout) or nu nu (in Hawaiian). Trumpet fish can be seen slowly cruising the reef looking for unaware prey. The unsuspecting prey is vacuumed up into the mouth tube as the jaws open suddenly. Blue-Mottled Parrot fish (Scarus dubius) or Uhu (Adult Male shown). These fishes have hard beaks that they use to munch on coral which they turn to sand. It has been reported that they also eat brittle star starfish. At night, the Parrot fish sleeps in a mucous cocoon. They are often caught by spear fishermen and are known for their soft white meat. Umaumalei or Orange Spine Unicorn Fish is one of many different tangs found in the Hawaiian islands. 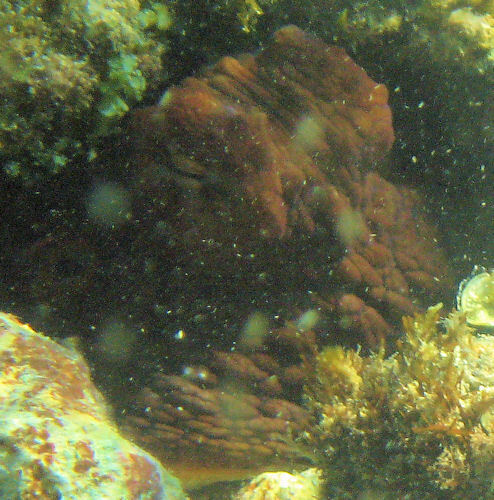 Most are algae eaters and keep the reef from getting clogged with coral-smothering algae. While edible, they tend to taste a bit like the seaweed they diet on. 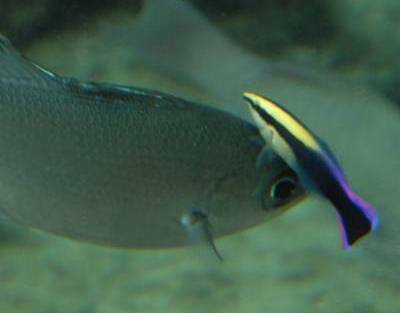 They are also called surgeon fish due to the sharp, extensible knife-like spines on their tail. 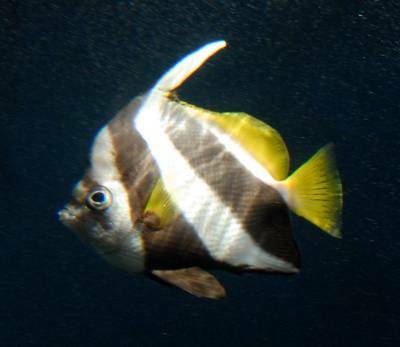 The Convict tang or Manini are found in nice schools of twenty or so as they dart in and out of the reef. 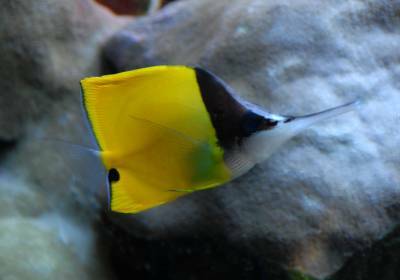 As with the rest of the tangs, they are herbivores, living on seaweed and algae. The Hawaiians salted and dried the small manini and traded them as a source of fish for inland communities. The Hinalea or Saddleback Wrasse is a common sight on Hawaiian reefs and is fairly gregarious, even to the point of eating out of divers hands. Be careful about feeding the Hinalea, however, as they have sharp teeth and occasionally miss the food. Shown here is a Hinalea being cleaned by a Hawaiian Cleaner Wrasse. Both Aholehole (center and bottom) and Mullet (top left), shown here, are schooling fish and are found in great numbers in shallow waters and along inlets to Hawaiian streams and rivers. Both fish were raised by the Hawaiians in fish ponds for year long access to fresh stocks. 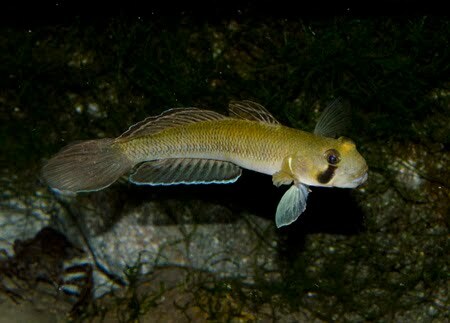 The Threadfin (Polydactylus) or Moi typically live in sandy bottomed areas where they use their feelers to search for crabs, shrimp and other crustaceans in the sand. The Hawaiians used to stock Moi in fishponds for the Alii, the Hawaiian Royalty. The Moi have become less common in recent years and, hopefully, renewed efforts to farm Moi will relieve some pressure off of wild stocks. Chaetodon lunula is also known as the Racoon Butterfly or kikakapu kapuhili. 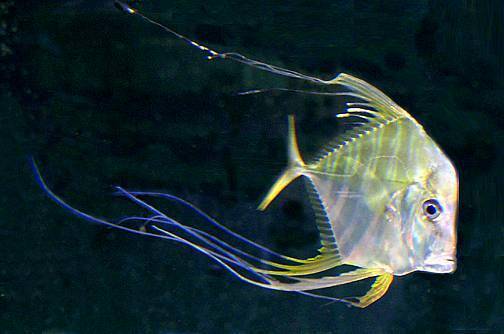 Racoon butterfly fish occur from very shallow water (few feet) down to moderate (20-30 ft) of depth. 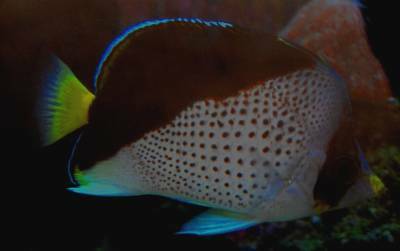 The Saddleback Butterfly, Kapuhili or Chaetodon ephippium, often swim in pairs and are one of the rarer Hawaiian Butterflyfish. 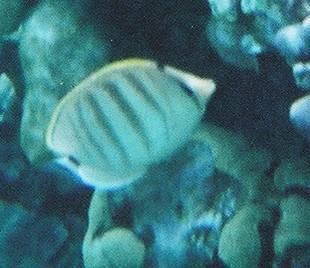 Tinker's Butterfly or Chaetodon tinkeri was named after Spencer Tinker, original curator of the Waikiki Aquarium. 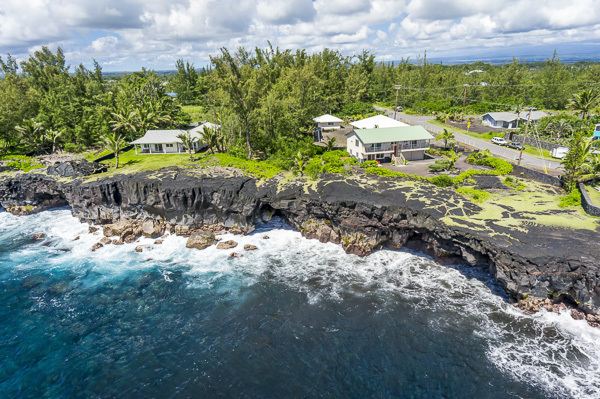 Once thought to be endemic to Hawaii, it has since been found in other locales. Typically lives in deep water. The Pyramid Butterfly (Kihikihi or Hemitaurichthys polylepis) is found in large schools at the base of deeper water (100ft.+) cliffs. 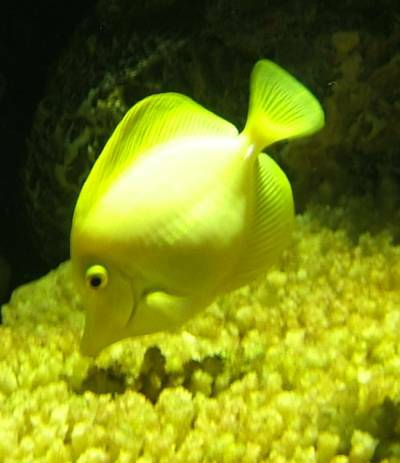 It is fairly unique in coloration among butterflyfish. 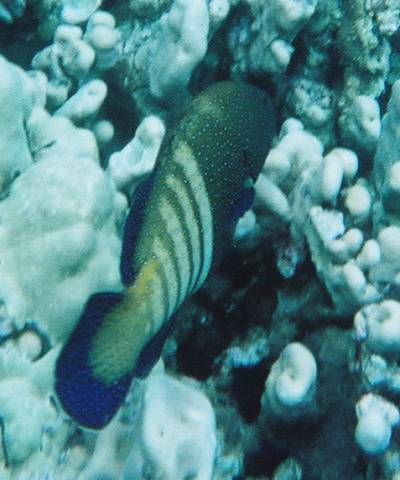 The Penantfish or Heniochis diphreutes (Kihikihi) is found off of Hawaiian reefs and is also occasionally seen as an aquarium fish due to its omnivorous habits. 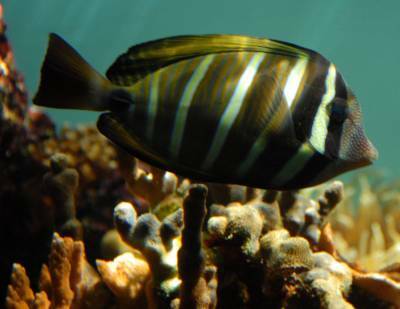 The Sailfin Tang, Zebrasoma veliferum or 'api, is fairly common in shallow reefs and surge areas, often spreading it's dorsal fin wide to reveal the dramatic striping. The Red Labrid or Yellow Tail Wrasse (hinalea aki lolo), juvenile form, is shown here. The adult form has a yellow tail and brilliant blue spotting. The Hawaiian name refers to the adult form's "lazy" habit of spending most of its time buried in the sand with only its snout protruding. 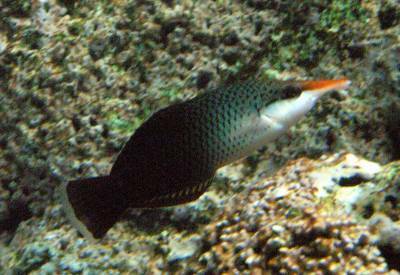 The Bird Wrasse, Hinalea i'iwi or Gomphosus varius, comes in two color forms. The female is shown and the male is a dark green-blue. It can be found cruising around shallow reefs where it uses its long nose to reach into crevices for small crustaceans. 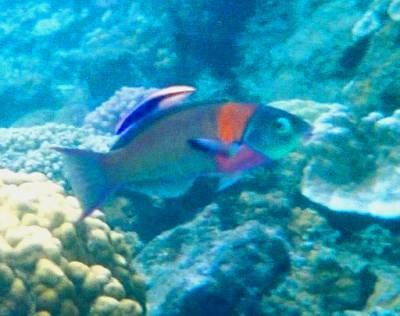 The Female Banded-Nose Parrotfish (shown) or Uhu (Scarus perspicillatus) is red and the male is blue-green. 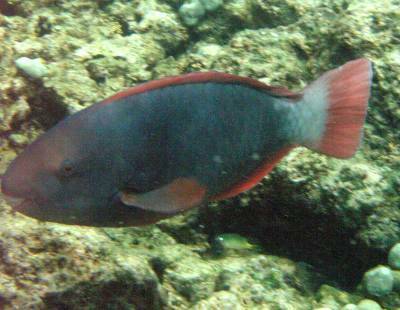 The Banded-Nose Parrotfish appears to be endemic to the Hawaiian isles although, due to the color variability, parrotfish taxonomy is somewhat uncertain. Parrotfish use their sharp teeth to bite off chunks of coral as well as small invertebrates and subsequently excrete crushed coral sand. They are quite the sight as their massive forms glide across the reef or even as they sleep in their mucous cocoons. 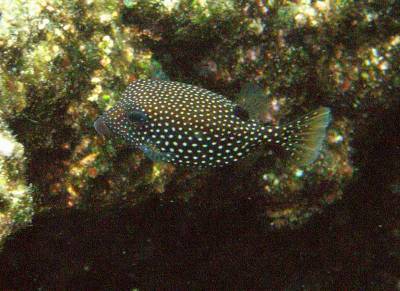 The Spotted Boxfish, Ostracion melealgris, female. Male spotted boxfish have brilliant blue sides and bottoms. The Spotted Boxfish is common on shallow reefs. 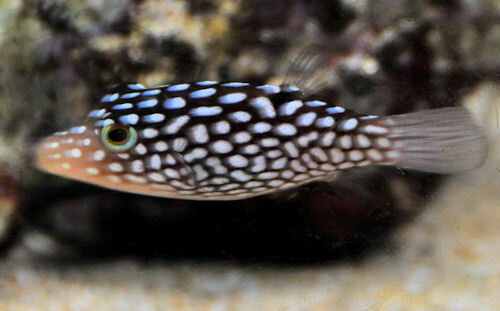 The White Spotted Puffer (Carthigastor jactator) is one of the smallest puffers in the Hawaiian isles, attaining maturity at 3 inches. They use their hard beaks to crush small invertebrates and are one of the most commonly seen puffers in shallow water. 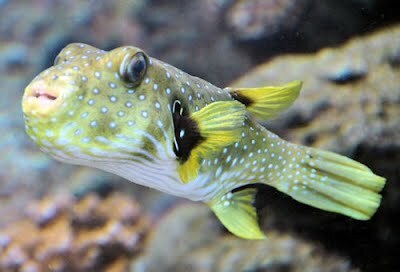 The Stripebelly Puffer, Arothron hispidus, 'O'Opu Hue. 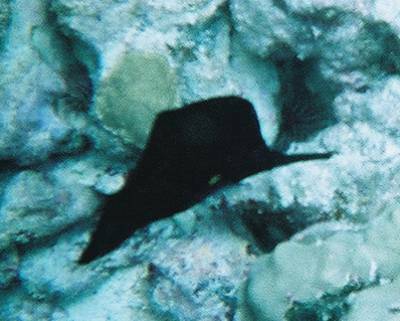 These friendly guys are common at all depths and are frequently seen hovering over the reef at Ala Moana and Waikiki. They use their sharp beak to make short work of crustaceans and mollusks. 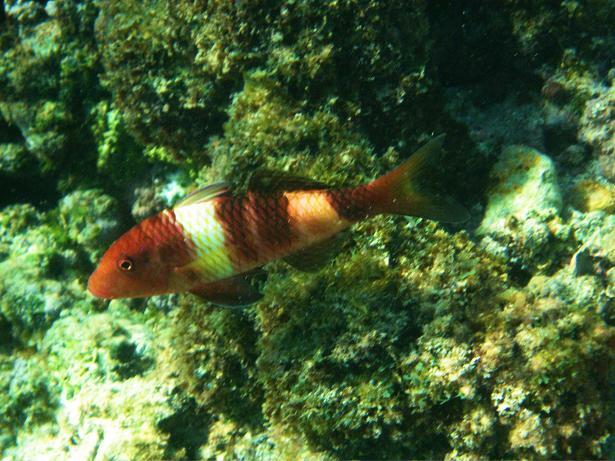 The Manybar Goatfish (Parupeneus multifasciatus), or Moana in Hawaiian, is frequently seen roaming shallow reefs often accompanied by manini (convict tang), typically alone or in pairs. 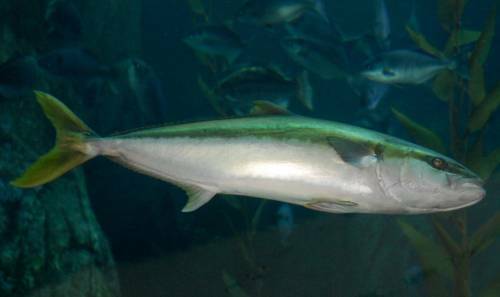 The Amberjack or Yellowtail is known as Kahala in Hawaiian and is prized for its great taste. It has been known to grow up to 120 lbs. and is a popular deep water game fish. 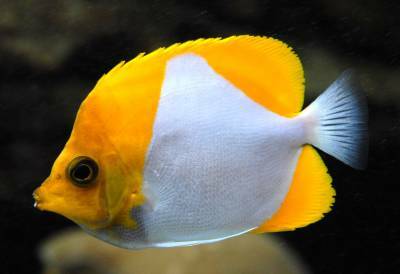 The Yellow Tang, Zebrasoma flavescens, is called lau i'pala in Hawaiian, named for the yellow shimmering ti leaf that they resemble. 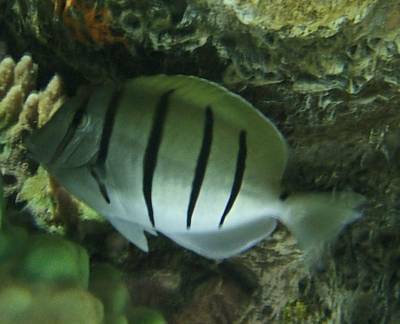 These fishes are fairly common in Hawaii although the aquarium trade has taken some toll on the Hawaiian population. As with the rest of the tangs, they are herbivores. 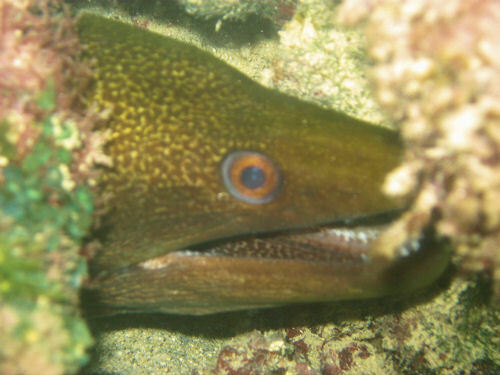 The White Mouthed Moray, Gymnothorax melealgris, Puhi 'Oni'o. Common at scuba depths. 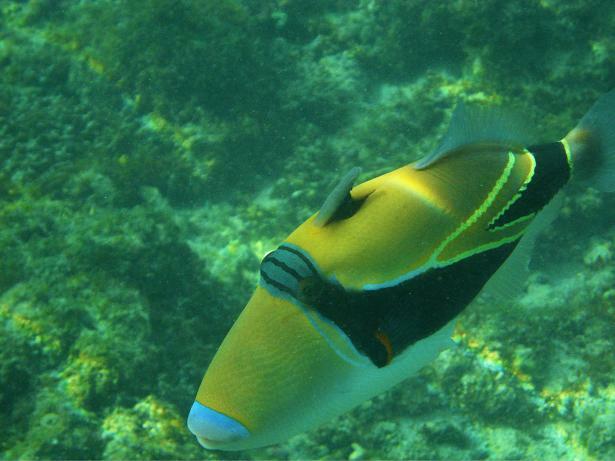 This one calls Waikiki home and is regularly seen swimming around the reef. 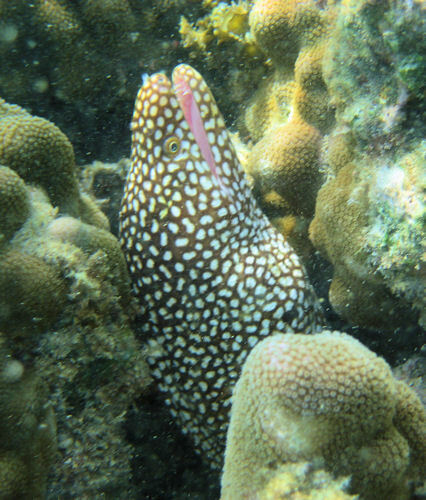 The Yellow-Margined Moray, Gymnothorax flavimarginatus is called Puhi paka in Hawaiian. These morays are commonly seen at all depths in Hawaii and are known to get positively HUGE. I remember two I saw as a child that were both over 6 feet long and 8 inches in diameter. The Flying Gurnard, Dactyloptena orientalis. The Gurnard uses the front rays of this pectoral fins to scratch in the sand for invertebrates. When the hapless invertebrate pops out of the sand, the Gurnard pounces on it. I believe that the wide pectorals funnel the prey forward towards his mouth. These are found on sandy bottoms and are not at all common. 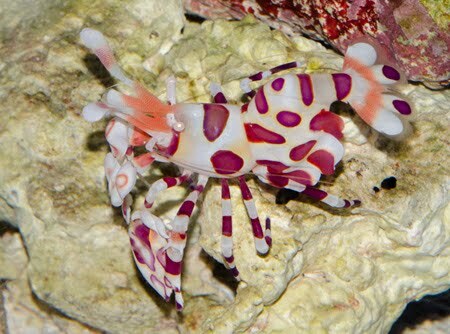 Harlequin Shrimp, Hymenocera picta. These little shrimp are found at diving depths, typically near Linkia starfish, which they prey upon, often munching off a leg at a time. They are somewhat uncommon, having been extensively collected for the aquarium trade. 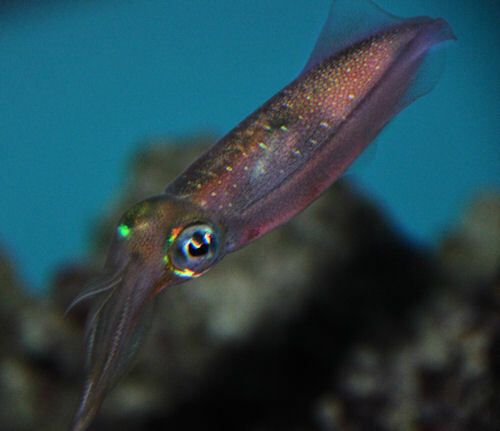 Cuttlefish or muhe'e is typically found in moderate depths swimming in groups. Cuttlefish differ from squids in having an internal shell, the "cuttlebone" on their back. You may recall the cuttlebone being sold to provide calcium for parakeets. If you look closely, you can see the cuttlebone through the translucent body of this cuttlefish. 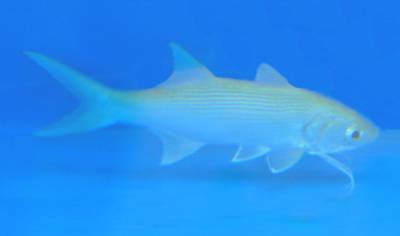 The o'io or Short Jaw Bonefish, Albula glossodonta, is typically found in shallow reef flats and sandy bays through 100 ft. I've generally seen this fish traveling in small schools of around 20 or fewer individuals. They are smart, inquisitive fish, often circling the diver for closer inspection (in protected areas). They are capable of great speed and put up quite a fight if caught on rod and tackle.